Part of a three-year renovation plan of more than $100 million, The Spa at Silver Legacy is Reno’s ultimate luxury spa experience, opening fall 2018. Al fresco natatorium, part of The Spa at Silver Legacy. THE ROW combines luxury, elegance and the natural beauty of Reno-Tahoe with the addition of The Spa at Silver Legacy, opening fall 2018. Northern Nevada’s newest luxury spa experience introduces phase II of a master renovation plan of more than $100 million which began late 2016. Designed in collaboration with Resources for Leisure Assets, USA and MBA Architecture + Interior Design, The Spa brings the largest treatment facility to northern Nevada, offering premier services in relaxation, beauty, fitness and retail in the Heart of Reno. The 21,000-square-foot spa treatment area is surrounded by windows, inviting the natural light to emanate throughout. The Spa includes three couples treatment rooms, four individual treatment rooms, five facial treatment rooms, three relaxation lounges, a salt inhalation chamber, two private hospitality suites, seven hydrotherapy soaking tubs, two steam rooms and two saunas. 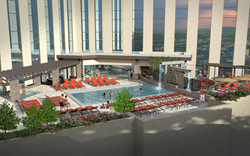 The al fresco natatorium—a rejuvenating swimming pool and focal point of the additional 8,000-square-foot deck area—includes a waterfall and fire feature, coed hot soaking tubs, and shaded seating and sunbathing lounges intended for pre- and post-treatment relaxation. Powell-Lopez brings 24 years of experience leading four- and five-star spa destinations around the country. He has launched over 30 esteemed spas, including The Red Door Spa in Union Square, New York, and Pure Spa in Fort Lauderdale, Fla. Dedicated and experienced massage therapists, estheticians and beauty experts use high-quality, professional products to indulge, pamper and transform. Custom and creative spa treatments incorporate the dueling elements of Reno’s high desert heat with Lake Tahoe’s crisp, therapeutic waters. The signature Fiery Snow facial alternates between warm and cool temperatures for immediate skin radiance. A cherry pepper peel is used to open pores for a thorough cleansing, while a cooling mask treatment detoxifies and minimizes pore appearance, offering immediate nourishment and firming. The Fiery Snow Massage incorporates traditional hot stone therapy and cool stone chasers to invigorate and relax the muscles. The differences in temperature offer a relaxing effect on the body. Using ancient healing properties of tea, each spa treatment offers a custom-blended tea that corresponds with the purpose of the massage. The Fiery Snow Massage comes with a complimentary cooling tea to further invigorate the body from the inside out. Powell-Lopez researched indigenous scents of northern Nevada with the assistance of experts from the University of Nevada, Reno. The botanical ingredients—which are encapsulated in oils, scrubs, candles, body and hair treatments—are designed to inspire a one-of-a-kind scent and enlightening experience. The classic white pine tree, reflected in The Spa’s logo, was infused with sage to create a full sensory, authentic replica of the great outdoors. The revitalizing spa journey includes the Salt of the Earth blending bar where guests can customize salt scrubs for use in signature treatments. The personalized blends can be purchased for an extended home spa experience. The Spa at Silver Legacy includes The Salon and The Boutique, offering one-of-a-kind expertise in hair, skin care, nails and beauty cosmetics. Locally sourced and botanically based skin care lines Sorella and OM4Men accompany products composed with The Spa’s custom-created scent. The Salon—an opulent, full-service beauty center—includes three pedicure stations, two manicure stations and four hair and makeup stations. With cutting-edge beauty experts and stylists, The Salon brings the latest in cosmetic fashion to THE ROW’s discerning and loyal guests. The Boutique allows guests to further their experience with topshelf products in skin care, body, hair and cosmetics. Guests can accessorize with unique apparel, handcrafted jewelry and artisan goods. The adjacent, state-of-the-art fitness center provides modern equipment for a fully-rounded health and wellness experience, complete with both a cardio room and strength training area. Unique to northern Nevada, Technogym cardio equipment brings the outdoor experience to fitness enthusiasts by way of virtual reality with real life hiking, biking and running trails. Beverage options mimic the artistry and elegance of The Spa’s design, offering Champagne, mimosas and a curated list of craft beer, wine and specialty cocktails. Specialty, gourmet entrees and smoothies are available for the health-minded guest, furthering THE ROW’s commitment to creative and authentic cuisine. In late 2016, Eldorado Resort Casino, Circus Circus and Silver Legacy Resort Casino began a two-part renovation plan, investing more than $100 million over a three-year period. When finished, the resorts will have remodeled over 4,000 rooms and suites, added 12 new restaurants, including a Family Food Court, and will have completed upgrades to the iconic Eldorado Showroom and additional event and public spaces. In 2017, the resorts won a Shaw Contract and Design Award for its redesigned Midway—a carnival-themed entertainment center with live circus acts daily. The Spa at Silver Legacy invites guests to relax the body and renew the soul. Watch an exclusive video here. Silver Legacy Resort Casino is a 1,600-room premier destination, located in the heart of Reno and boasting the perfect amenities for any getaway: spacious guest rooms and spa suites, over 50 headlining entertainers a year, seven award-winning restaurants including LA’s famous Canter’s Delicatessen, a state-of-the-art Poker Room and Laugh Factory Comedy Club, the #1 comedy club in the country. For more information about Silver Legacy Resort Casino, visit SilverLegacyReno.com or follow Silver Legacy on Facebook, Twitter and Instagram and use #SilverLegacy when uploading your photos to Facebook, Twitter and Instagram. Resources for Leisure Assets, USA is an international creative design and project management company that works with hotels, destination resorts, mixed-use real estate developments, active living communities and healthcare centers to integrate wellbeing hospitality® assets. Resources for Leisure Assets, USA designed luxury wellness destinations, including the Ritz-Carlton Paradise Valley; Cecina Resort in Italy; and IFA Hotels & Resorts, Pine Cliffs Resort in Portugal. For more information, visit: resourcesforleisureassets.com. MBA Architecture + Interior Design has a reputation for creating successful and dynamic spaces, and has amassed a large portfolio of projects since the firm was established in the 1983. Projects include a variety of buildings and spaces, ranging from hotels, casinos, and time shares to parking garages, convention spaces, office buildings, medical facilities, retail centers, restaurants, and entertainment venues. For more information, visit: mbarenonv.com.